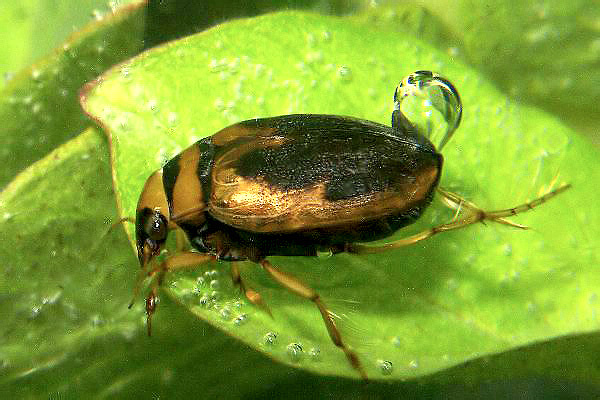 Hygrobia hermanni, copyright Frank Koehler. The Dytiscoidea is a clade of predatory beetles united by the possession of extensively fused mesal metacoxal walls (Ribera et al. 2002). Though all dytiscoids are found in damp habitats, advanced swimming abilities through simultaneous strokes of the hind legs are only found in species of Noteridae and Dytiscidae. Hygrobiidae swim with alternate movements of the hind legs, while Amphizoa and Aspidytes do not swim. Meru phyllisae is known from a whitewater cascade in Venezuela, where it crawls over submerged dead leaves lying on the exposed bedrock (Bouchard 2014). Simultaneous strokes also appear to have been the swimming mode used by the Coptoclavidae, known from the Jurassic and Early Cretaceous; these beetles were mostly excellent swimmers and several genera even became adapted to marine environments (Beutel et al. 2013). [PX01] Philips, T. K., & W. Xie. 2001. Amphizoidae LeConte, 1853. In: Arnett, R. H., Jr & M. C. Thomas (eds) American Beetles vol. 1. Archostemata, Myxophaga, Adephaga, Polyphaga: Staphyliniformia pp. 153–155. CRC Press: Boca Raton. [RB02] Ribera, I., R. G. Beutel, M. Balke & A. P. Vogler. 2002. Discovery of Aspidytidae, a new family of aquatic Coleoptera. Proceedings of the Royal Society of London Series B—Biological Sciences 269: 2351–2356.